Jardin is a classic, Antioquian pueblo. Old and beautiful; at the same time entirely unique and oh-so similar to every other pueblo here. 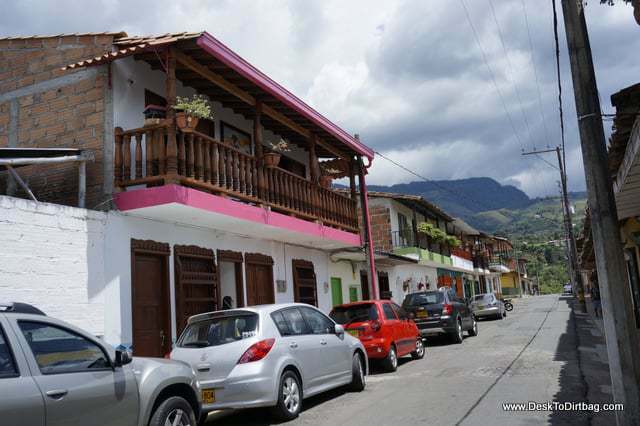 Thankfully, there are a number of things that set this pueblo apart, and there are so many things to do in Jardin Colombia, making it one of my favorite pueblos across Colombia. The main plaza of Jardin is a lively place. 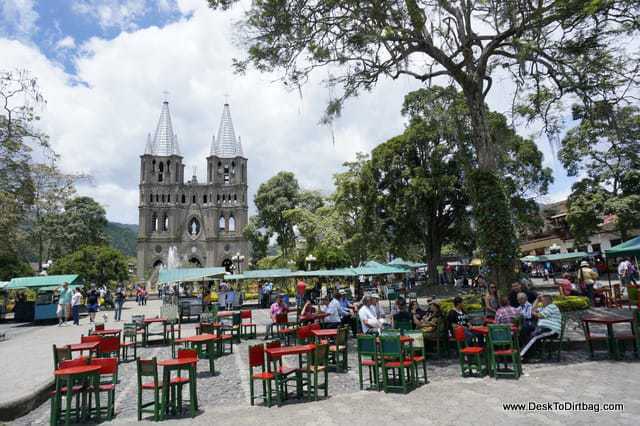 A large and ornate Catholic church anchors the center of the town with a large plaza outside which is where the center of the town’s social life and activities take place, with extremely narrow cobblestone streets radiating out from this point. The narrow streets of Jardin. Another long weekend here in Colombia means another trip out of town. 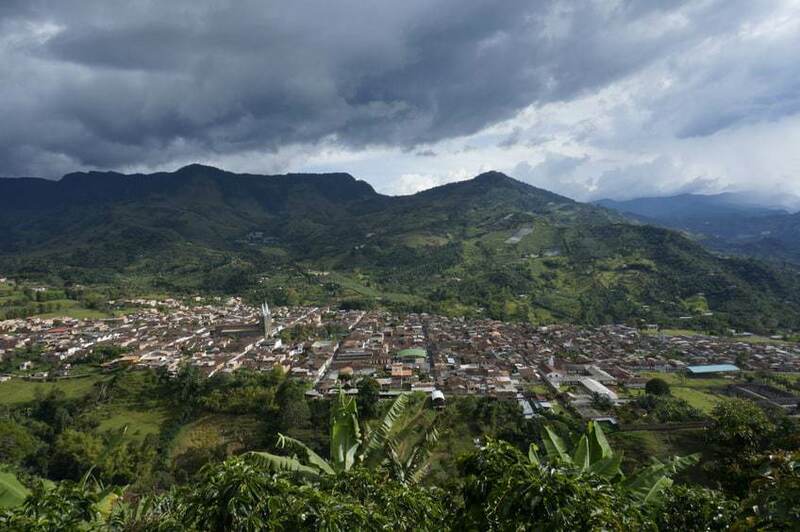 Andrea and I headed out to the popular tourist town of Jardin, Colombia, located 3-4 hours south of Medellin near the coffee region. Jardin is a town that you hear a lot about here, but neither myself nor Andrea had ever been, so we jumped in her car for the drive south. Andrea and her little car. I’ve become more and more accustomed to the driving here in Colombia, as absolutely crazy as it is. Cars darting in and out of traffic, passing on blind corners, riding your tail relentlessly… It is almost a game here to drive as aggressively as possible. 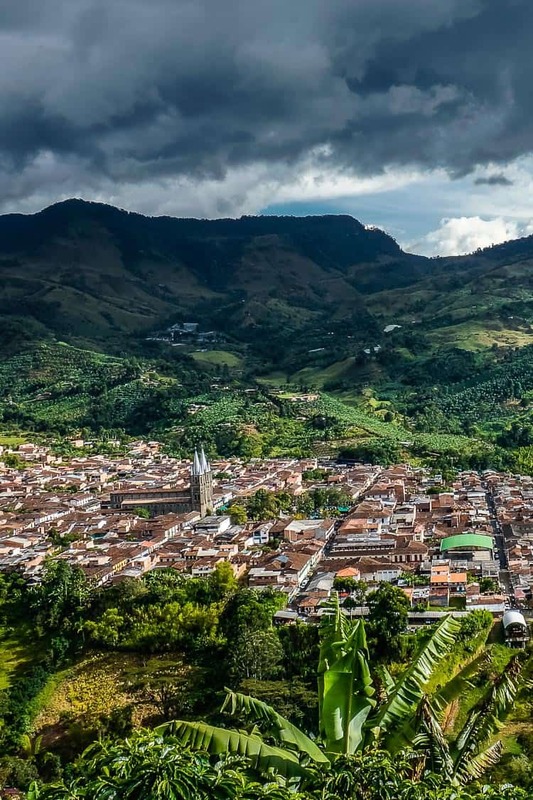 The drive is typical of Antioquia–two lane roads winding perilously through the mountainous scenery. It is beautiful and awe inspiring. 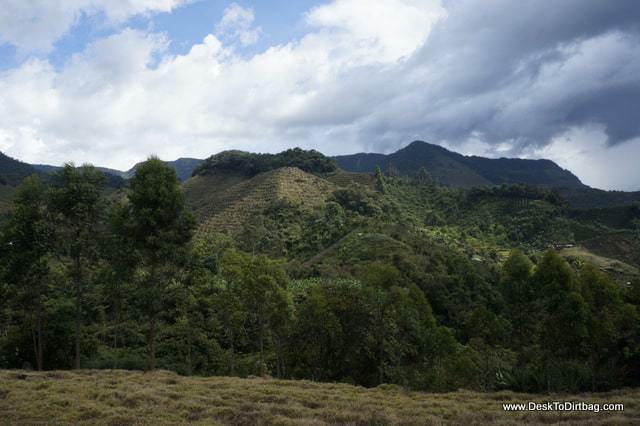 At one point we drove past the infamous Cerro Tusa–a nearly perfect pyramid on the skyline. One that kept causing me to crank my neck in its direction with longing thoughts of the view from the top. This idyllic little pueblo offers up a number of interesting or unique activities that make it ideal for a few days or even a week of travel. Here’s what we did or discovered, and what I’d recommend to others. Arriving in Jardin we passed through town to the outskirts where all the trout farms are located. We were on a camping kick recently and wanted to keep it going. 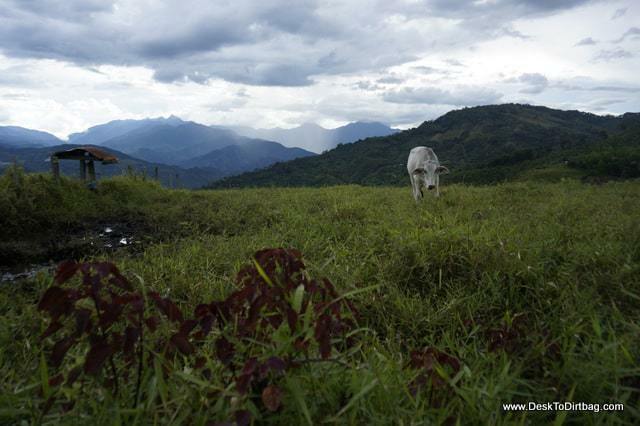 As with most places in Colombia there aren’t really many opportunities for just camping out and about in the wild. Indeed, there aren’t even really campgrounds in Jardin as we had found in Rio Claro. 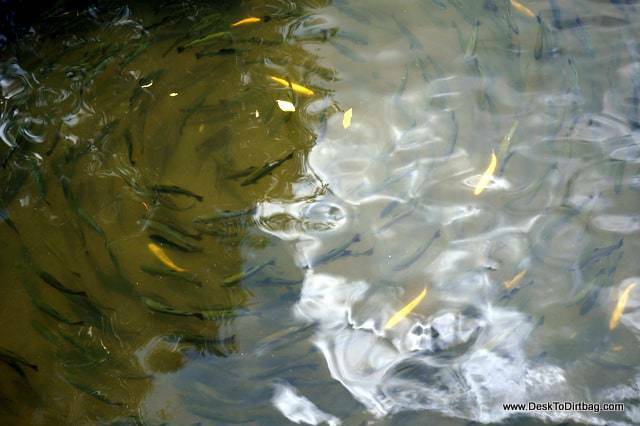 The network of streams and pools to circulate the water for the fish. Instead we found a trout farm that had a number of tents for rent that were setup on a large wooden platform with a roof. Kind of a strange, open-sided barn. 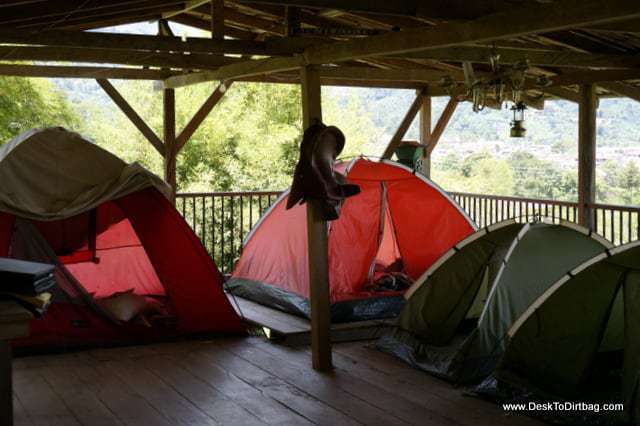 The covered camping platform–tents are pretty close together, but we had it to ourselves. Our rental tent with comfy sleeping mats, pillows and sheets. Our camp was directly above the ponds and streaming water where the trout were raised. A camping experience like I have never had before, that’s for sure. Truchera Montemar is also a restaurant where you can catch your lunch fresh, have it cooked up immediately, and served with some tasty patacones and rice. Very cool and super delicious. View of the town from the trout farm. The town of Jardin is worth checking out for your typical pueblo life, where people pass their time hanging out in the main square. 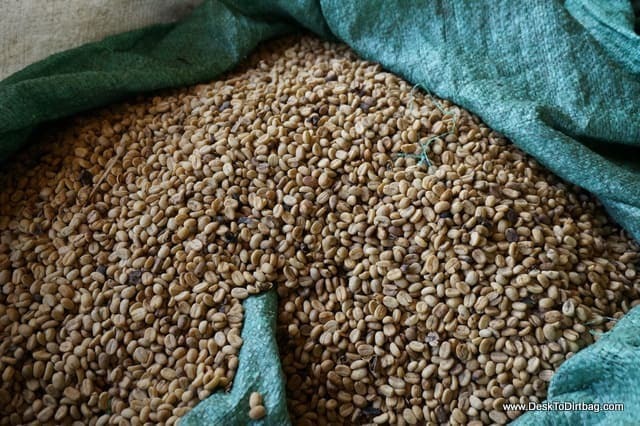 If you enjoy good coffee, I strongly recommend a visit to Cafe de los Andes a small chain and co-op throughout Antioquia that supports the farmers growing this wonderful bean. 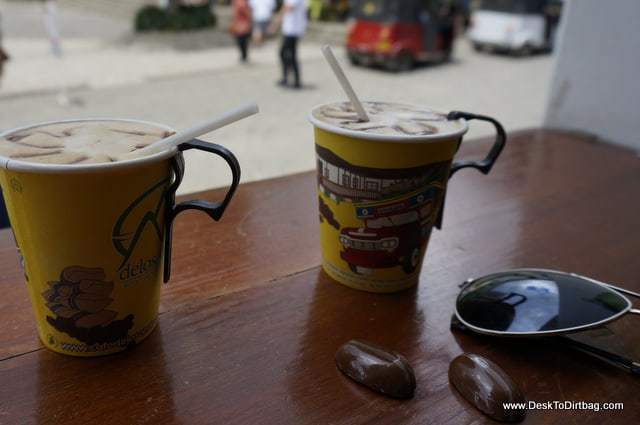 Great coffee right off the main square at Cafe de los Andes. Around Jardin you can find a number of adventurous activities including hiking, paintball, ziplines, paragliding and more. One item that I have heard a lot about and would love to do on a future visit is a trip to the Cueva del Esplendor, a beautiful series of caves and waterfalls a few hour hike outside of the city along with the Salto de Angel waterfall nearby. 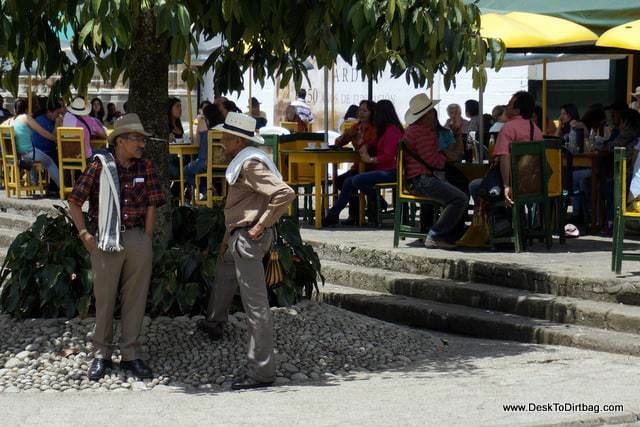 Traditional coffee grower attire in the region. We went down there for a weekend of just relaxing and getting away from the hustle and bustle of Medellin city life, the internet, work, and those things, and thus didn’t get out on the trail. 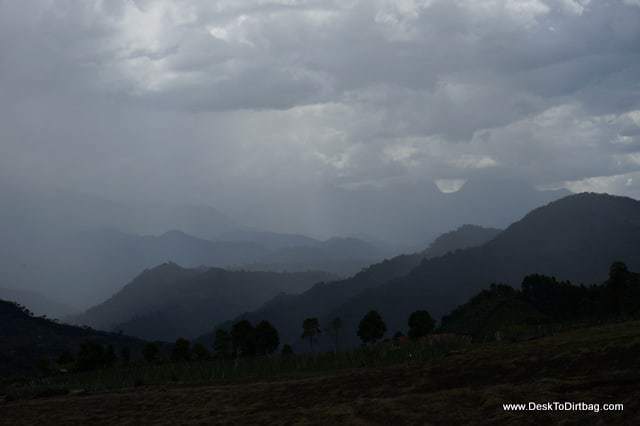 A rain storm descends upon the surrounding mountains. 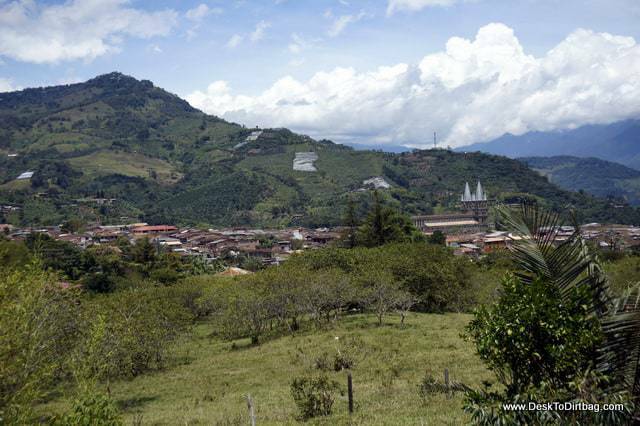 The terraced coffee hills surrounding town. 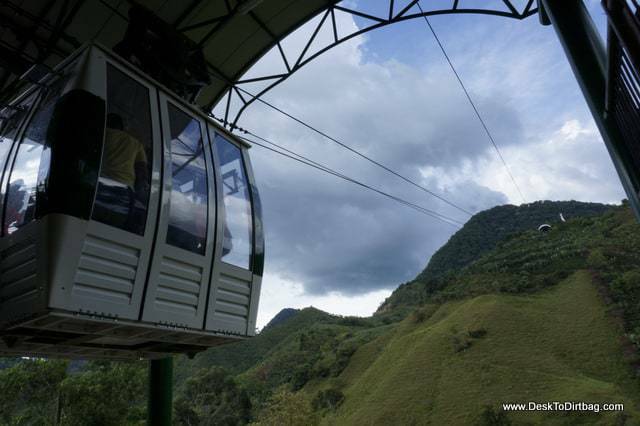 One of the most easily accessible activities that you have to do is a ride up the cable car (gondola) which brings you to a lovely vista overlooking the pueblo, set among coffee farms and banana plantations. A cable car takes you to the top of a beautiful vista. 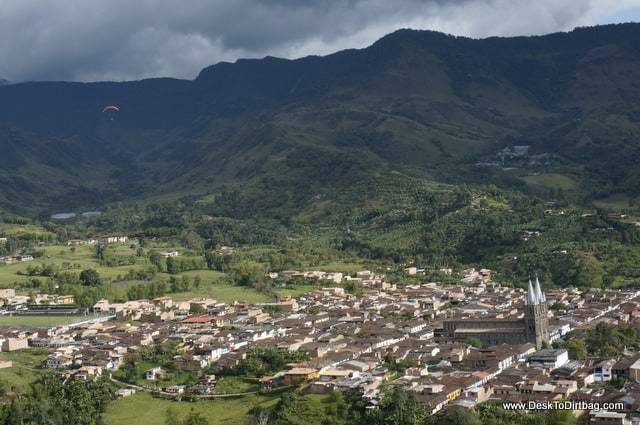 Paragliding is another popular activity in the area. 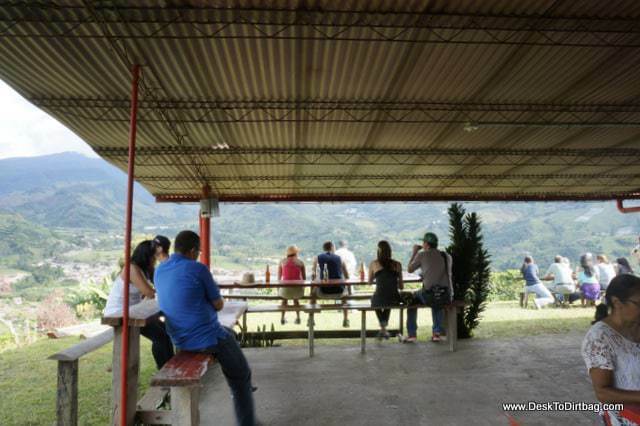 There is a nice little tienda at the top where you can purchase a drink, take in the view, and even hike back along the road through the neighboring farmland. The small tienda overlooking town. Hiking through the farm land. 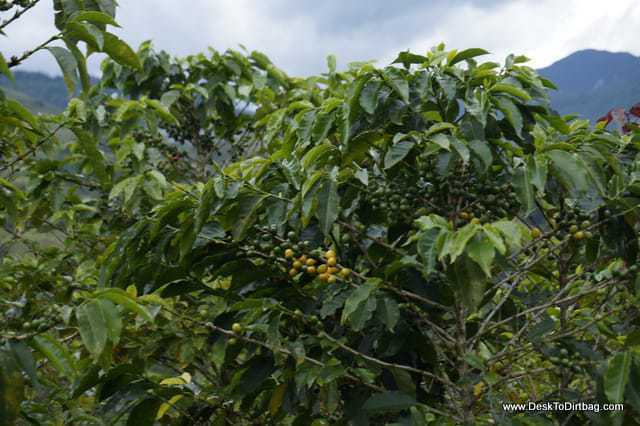 Lots of coffee plants all over the place. All-in-all, Jardin makes for a nice weekend getaway for outdoor exploration. Camping at the trout farm was certainly a unique experience, and since they have tents on the property it is available to all travelers, including those who didn’t bring a tent and might not have planned to do any camping. 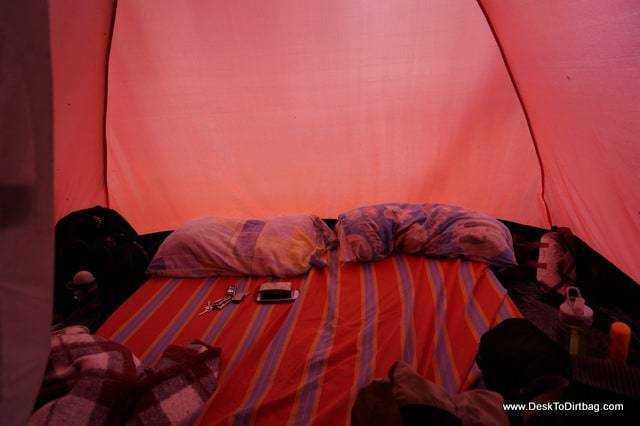 The tent rental includes big fat foam pads to sleep on, sheets, blankets and pillows. All for only 15.000 COP ($7.50) per person. The covered roof also ensures that you’ll stay dry in the tent–it does rain in that region fairly frequently. The downside though is that you aren’t really supposed to cook there–though I did take my (silent) little alcohol stove down beside the trout pond to boil up water for our evening coffee and such. 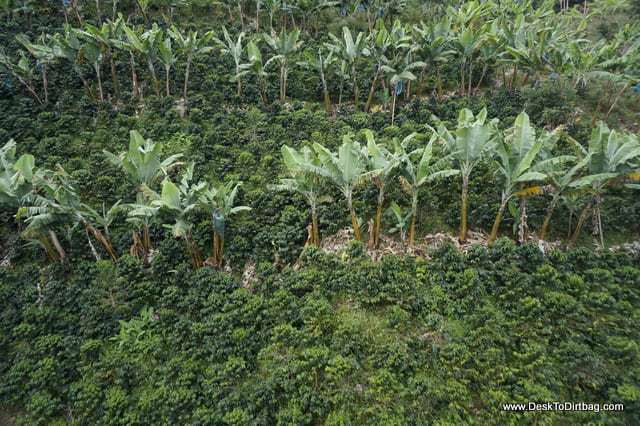 Coffee and plantains–these are a few of my favorite things. Jardin is a gorgeous, green, and lush area. If you are making a trip to the coffee region, be sure to stop by Jardin to grab a cup of coffee and dine on some fresh trout for lunch. Traveling to Jardin on your next trip? Book the perfect room on Booking.com today! My husband and I are wanting to camp on the Trout farm (Truchera Montemar, I believe) in Jardin… how did you get there? We have our own tent, do you think this is an option? 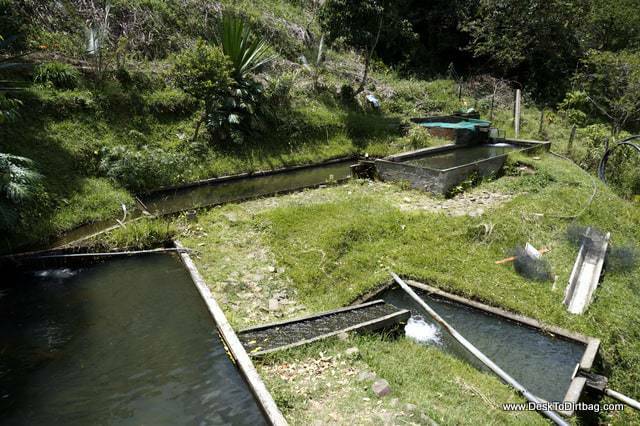 We had a car and drove to the trout farm, but I’m sure you can take a little chiva taxi there no problem. At the Montemar trout farm where we stayed, they had all the tents set up there already for their guests on that wooden platform… But they might consider a different price if you bring your own tent. It was a little crowded on that platform though, so I’m not sure if they’ll do it or not. Let us know!